Home » How to transfer MKV/AVI/TiVo files to Galaxy Tab 2 10.1? Compared to the original 10.1 slate, Samsung's new Galaxy Tab 2 10.1 offers near-identical specifications, including a 10.1-inch, 1280 x 800 PLS display, dual-core 1GHz chip, 1GB of RAM and a minimum of 16GB of internal storage. But there is one detail we need mention: Samsung is finally starting to understand that consumers want tablets, but just aren't ready to pay a lot of money for it. Samsung dropped the price by about hundred bucks, so that it now starts at $400. At $400 for a Wi-Fi 16GB model, the Galaxy Tab 2 10.1 is $100 cheaper than Apple's new iPad 3. Aside from specs and low price tag, how about watching videos on Galaxy Tab 2's 10.1-inch display? The same with most popular portable devices, Samsung Galaxy Tab 2 10.1 slate does support video files in specific formats, including MP4, DivX, Xvid, H.264 and H.263. In case your video files are not in this range, you need use Pavtube Galaxy Tab 2 10.1 Video Converter to do format conversion in advance. The following guide will demonstrate how to transfer MKV/AVI/TiVo files to Galaxy Tab 2 10.1 in simple steps. 1. 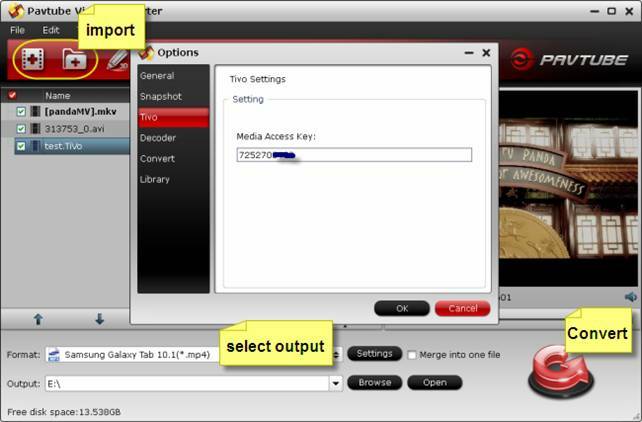 Run Pavtube Galaxy Tab 2 10.1 Video Converter, and import your source files to it. You can either import source video clips one by one, or load through a folder at a time. Note: When you adding TiVo files into the program for the first time, a popup window will ask you to enter Media Access Key of your TiVo DVR, do as it required, after that, the TiVo recordings will be loaded successfully. 2. Select "Samsung Galaxy Tab 10.1(*.mp4)" as output format No matter you need convert MKV to Samsung Galaxy Tab 2 10.1, or transcode TiVo Recordings to Tab 2 slate, or run AVI on the Galaxy tablet 2 10.1, you should select "Samsung Galaxy Tab 10.1(*.mp4)" as output format, because this optimized format will ensure you a well playback performance on your slate. 3. Convert MKV/AVI/TiVo files to Galaxy Tab 2 10.1 Click the big "Convert" button to start transcoding MKV/AVI/TiVo files to Galaxy Tab 2 10.1 supported MP4 format. 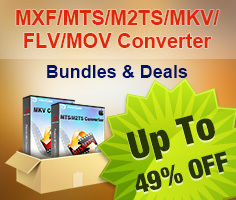 When the conversion is done, click "Open" button to get the converted MP4 files. Now you are able to transfer MKV/AVI/TiVo files to Galaxy Tab 2 10.1 for playback on the go.